Here's the deal: I used to love tomatoes. However, it's been a long time since I've really had a good one. After flying into a rage with yet another batch of grainy, tasteless tomatoes from the grocery store, I decided to fight back. "Screw you, crappy, gross tomatoes that ruin my BBQ cheeseburger," I said to myself. "I'm going to grow my OWN tomatoes!" There was only one problem: I don't have a clue on how to grow tomatoes. (Remember when I said that I took a gardening class but was too obsessed with a hottie-dude that I didn't really pay attention? It was legit.) Luckily, my in-laws gave me a book about vegetable gardening a while ago, so off to the bookcase, I went. A few pages in, though, things started to fall apart. Because we have lots of rocks in our ground and a family of adorable wild bunnies living in our front forest, I need an above-ground vegetable garden. I won't bore you with the NASA-like logistics involved in such a thing but rest assured, there were MANY steps and I promptly lost my enthusiasm. And that was the end of The Tomato Project, or so I thought. We went to Costco to pick up a few things and, lo and behold, they were selling tomato plants. "Surely, I could handle ONE tomato plant, right?" I said to Marc, who had actually left the gardening centre, so I was actually just talking to myself. Without anyone to talk some sense into me, into the cart it went. 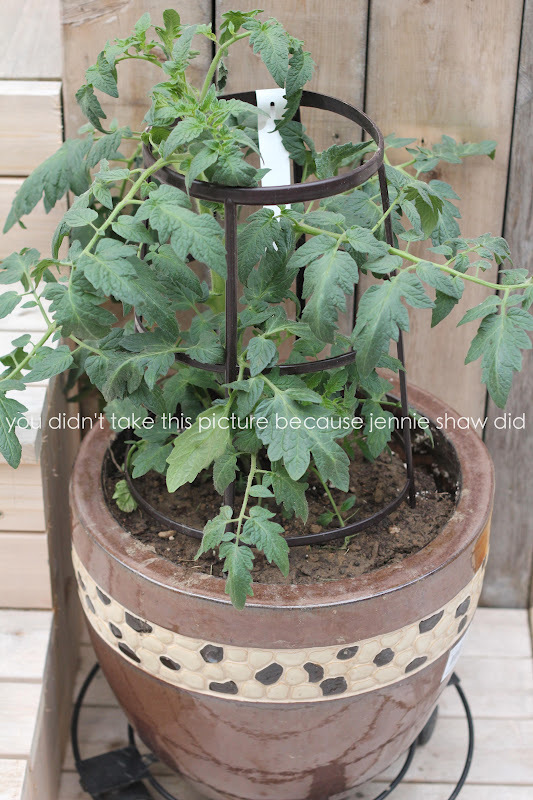 When we got home, I transplanted the tomato plant into a ceramic pot. The plastic pot came with the cage, so I cut it off and shoved it into the dirt of the new one. Reducing and reusing, people! The flower was already on the plant when we bought it, so I figured it'd be two weeks - three tops - until we were eating a crop of delicious tomatoes. 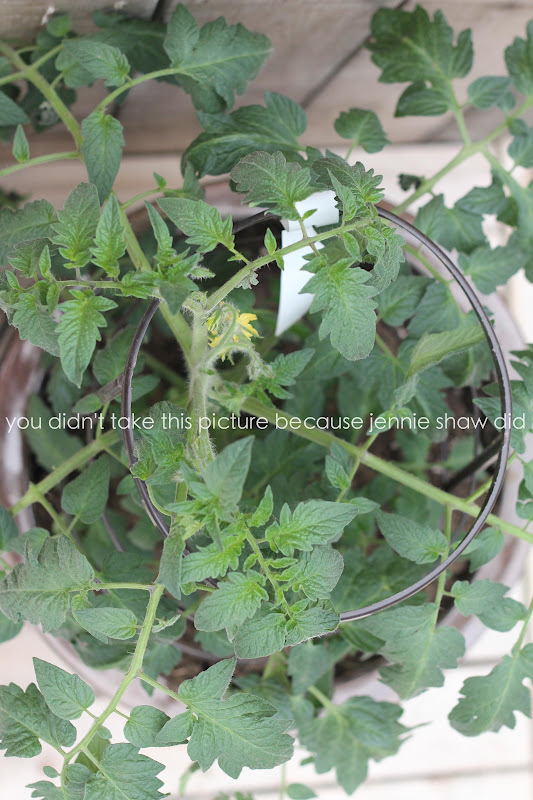 It's been over a week and the plant has gotten bigger, and has a new flower, but zero tomatoes. Then, my hetero-life-partner came over on the weekend and destroyed my dream told me that it'd be months until the flowers turned into tomatoes. Hey, you want to know what's super boring? Waiting for tomatoes to grow. But then, I had an idea on how to make it less borning. 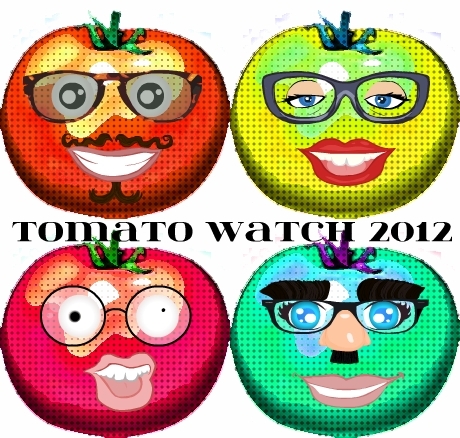 And that, dear readers, is the creation of TOMATO WATCH 2012. Putting faces on multicoloured tomatoes = awesome. So, dear readers, I'm hoping that my HLP is a little off in her estimate but only time will tell. In the meantime, I'm going to give that freaking plant so much love that it'll be impossible for it not to produce tons and tons of delicious red circles of delight. Oh yes, it's gonna be great! OMG. I can relate to this for many reasons...how about the first time I got a plant, I thought I was supposed to pluck all the flowers off (like on a basil plant.) Guess how many tomatoes I got?!? haha We can only grow cherry tomatoes, as we discovered DEER eating our other tomatoes late one summer night last year. Good luck to you and your tomatoes!! I will be getting a few plants later this week and will try, yet again. Never despair! !